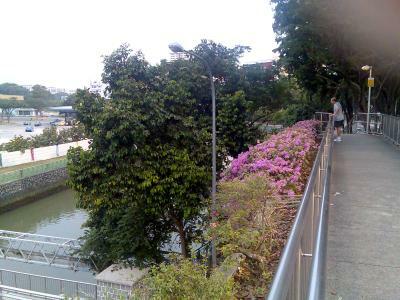 Recently, I visited the place where I spent a full 15 months or exactly one half of my active days in National Service. 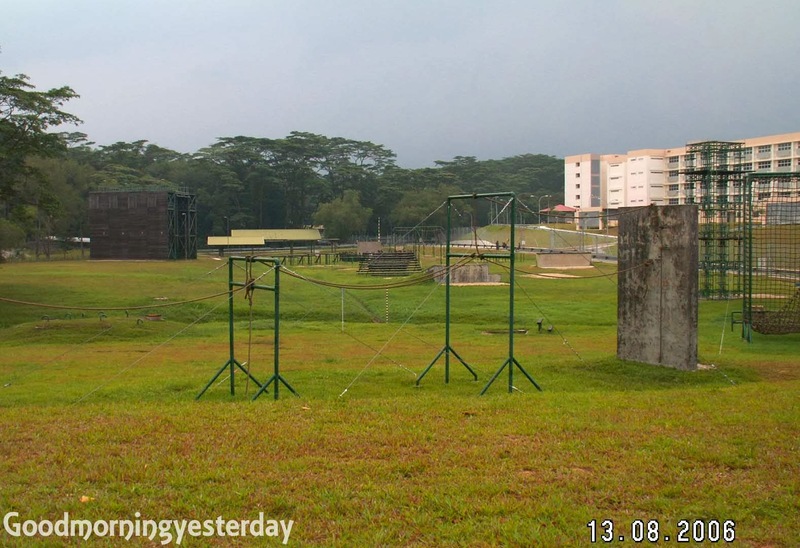 I am referring of course to the old SAFTI (Singapore Armed Forces Training Institute) in Pasir Laba Camp. As some of you might know, I am one of the 'editors' of the National Heritage Board's meta-blog, yesterday.sg; but we prefer to call ourselves Friends of Yesterday, or Foyers. My fellow Foyer, Peter Chan, is also an 'old boy' of Safti (henceforth, whenever I say Safti, I am referring to the old Safti and not the new Safti Military Institute). 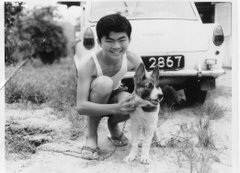 He too went through his OCS (Officer Cadet School) training in Safti and later served as an instructor and staff officer at OCS HQ in the mid 1970's. 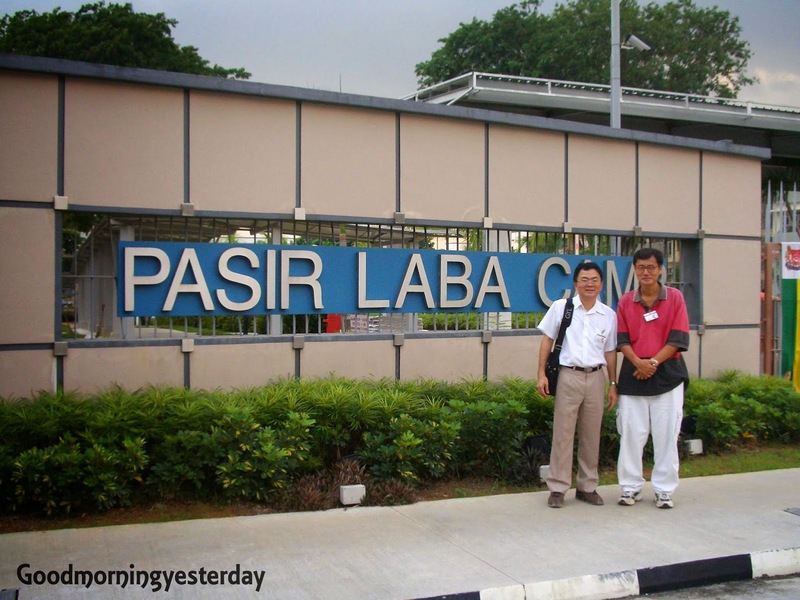 When the two of us heard that our Yesterday.sg project chief at NHB, Walter Lim, was also on the committee overseeing the Army Museum project, we practically begged him use his influence to arrange for us to make a brief visit to the Pasir Laba Camp. And so this was how Peter and I got to visit a place I have not set foot into for 29 years. Although from time to time, I did go to the demolition range as well as the rifle ranges during my combat engineers and reservist days, I have not set foot into Pasir Laba Camp itself since May 1977. And these two sentimental and thick-skinned 'lau pengs' (old soldiers) even had the gall to email a wish list of the 'must see' and ‘nice to have' places to our kind and helpful coordinator, Major Psalm Lew of the Army Museum Project Secretariat. Let me give you a brief report of the places we saw and the thoughts that when through my mind during this sentimental trip down memory lane. Our first stop was FOFO Hill. For the uninitiated, Fofo stands for Fighting On Fortified Objective. 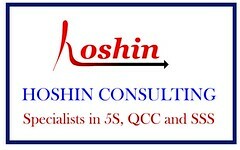 As I surveyed the area, I was surprised how much details of our training came back to me. 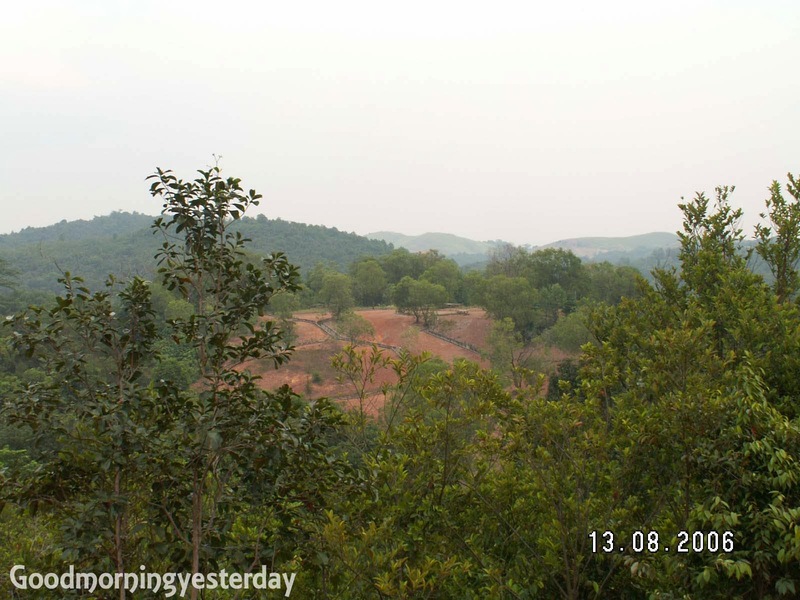 For example, I could clearly recognise the FUP area at the foot of Peng Kang Hill where the troops formed up waiting for the command to launch the attack on Fofo Hill. I also saw the 'gap' where we placed the Bungalore torpedoes for breaching wire obstacles and Dragon charge for breaching minefields. It was also here that we were taught how to cut barbed wires silently and to gauge the direction of the wind and toss our smoke grenades. I also recalled one nasty incident here. It happened during night training. I was firing away (blanks) in the zinc sheet lined trenches for some time before having to emerge and move to another location. So I placed my rifle on the edge of the trench and pressed down on the ground to lift myself out of the trench. Suddenly I felt a searing pain on my right palm. I had accidentally pressed on the barrel of my rifle which had become red hot from all that firing earlier. I got a nasty burn from that incident. Section (or platoon), 200 (distance in metres), 2 o'clock (to indicate the direction), Tree (or some other prominent object), Right: 2 fingers (followed by a description of what the enemy was doing. 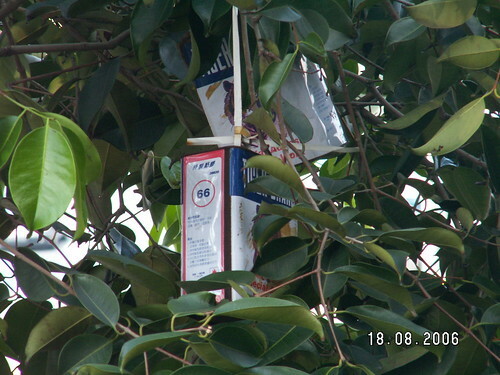 We liked to coin some silly description like: "Enemy reading comics under the tree") … the rest I cannot remember. I also found the area to be surprising peaceful and quiet. My mind’s image of this area was always filled with sounds of gunfire from the nearby rifle ranges echoing through the surrounding hills, and 3-tonners and land rovers speeding up and down Pasir Laba Road and troops marching or running or gathered in pockets attending lessons. After Peng Kang Hill we proceeded to the Pasir Laba Camp proper. On the way we stopped to see the obstacle course and the magazine where the famous 'haunted' Tower 2 was located. We were informed that the place no longer functioned as an ammunition dump and the 3 towers had been removed. We also stopped outside the reservist camp site which seemed to hold some memories for Peter. As for me, most of my reservist stints were spent on Pulau Tekong and the old Sembawang Camp. But now, all I saw was a concrete jungle comprising spanking new buildings with adjacent car parks and linked by clean new roads. The entire section that housed our beloved Safticana where we bought our sundries and snacks was gone. So were the lecture theatres which had huge banners with quotations like; “The more you sweat in peace, the less you bleed in war”. Fortunately, the three OCS blocks were still standing. They appeared to have been 'upgraded' and looked different from the ones in which I spent 9 grueling months as an officer cadet. Gone also was the huge field in front of the 3 blocks. 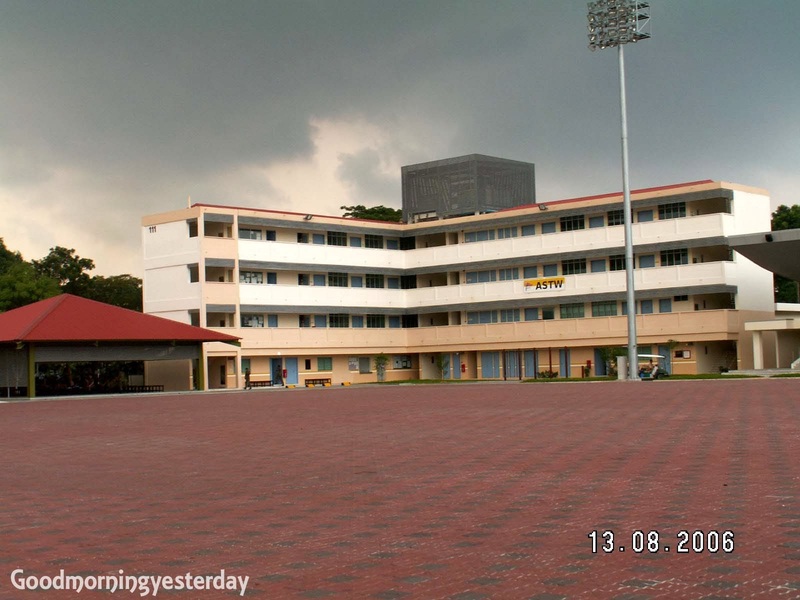 During my time, this parade square was black in colour. Finally, it was time to say goodbye and thank our hosts for their kind hospitality. As we drove down the short stretch of Pasir Laba Road in front of the camp, we caught a glimpse of that familiar perimeter fence along which we used to patrol when we were doing guard duty. I tried unsuccessfully to locate the nearby training shed from which we used to stare out at the Green Bus Service Number 175, envying the civilians for the freedom they enjoyed outside. Even as we drove home and tried to retrace the old Upper Jurong Road, and ended up in Jurong Point instead, we realised that just like Jurong Road and most parts of Singapore, the old Safti at Pasir Laba camp has transformed beyond recognition for people of my generation. Only the hills, it appears, have not changed. Blogger Gilbert of Block 13 wrote about his Humble Beginnings. He said; "Chicken is served on the table once a year on Chinese New Year. The prized cut being the chicken thighs were reserved for my third sister and my youngest brother." Earlier this evening I shared this at dinner table with my children and my wife recounted an incident from her childhood days in Ipoh. This would be in the 1960's. One day, her primary school English teacher was teaching the class the meaning of the word Cheese. It turned out that none of the kids knew what that was and what it tasted like. So the kind teacher brought a piece to class and peeled off tiny pieces for each of the kids try. I suppose cheese was a luxury and teachers' salaries were pretty low in those days. I am reminded of some of the 'humble' dishes that my family used to partake when we were kampong kids. 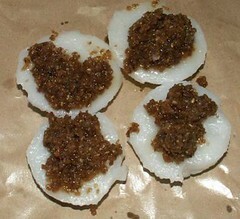 One of the common dishes that we frequently ate for lunch before leaving for afternoon class in primary school was 'chye poh' cooked in sugar. What you get is cubes of chye poh in thick sugary gravy which we usually ate with plain porridge. Sorry I cannot recall the English word for chye poh. It's the stuff you find on top of the chui kuehs. Alternatively, she would cook the similar dish using salted vegetables instead of chye poh. For cooking oil, we usually bought 'pui bak' or fat portions of pork which were then cut into cubes and fried to obtain the lard. I remember seeing my mum apply a layer of cool lard onto a slice of bread and eat it for breakfast. Occasionally, we had peanut butter. Do you know how to make a jar of peanut butter last longer? Let me teach you - not that you are likely to need this know-how. Scoop the peanut butter onto a frying pan, add water and sugar and fry until you get a more fluid paste which can be spread on bread easily. You can easily convert a small jar of sticky peanut butter into a tub of sweet-smelling, bread spread. 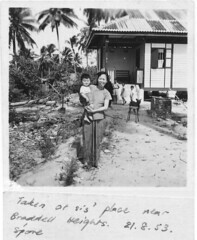 As one of my readers, Zen commented in my earlier post about Kampong Weddings, one of the most important qualities for a good wife in those kampong days, was frugality; the ability to manage a household with the minimum budget. With many kids and a low income, this was an essential skill. My mum augmented that skill by telling us stories of Chinese scholars of old; how they studied hard and scrimped on their food. One particular story was about this guy who studied late into the night and employed needles to prick himself every time he dozed off. Another chap was able to survive for days on a single piece of salted egg and porridge. Our prime minister wants us to share such stories with the young. I am not too sure the above stories are helpful for my kids. My wife and I already have a difficult time getting them to eat more. Whenever my son tries to scrimp on his lunch (for his precious aquarium fishes and pitcher plants, no doubt), he gets a scolding from my wife; "You think your parents cannot afford it meh?" 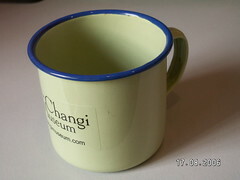 Recently I had the pleasure of attending the book launch of The History of Changi at the Changi Museum and took home a tin cup as a souvenir. This tin cup looks just like the ones that folks used during my kampong days in the fifties. Whenever I accompanied my mother to visit our neighbours, they would serve us coffee using a tin cup such as this one, although at that time it looked bigger. 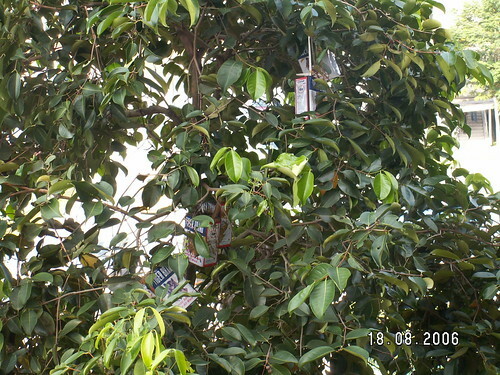 Tin cups or mugs were widely used by kampong folks. They came in an assortment of sizes and designs. I remember we had a neighbour who manufactured tofu in his house. We called him Tau Kua Kwan or Beancurd Kwan in Hokkien. Sometimes, we would buy soya milk from him using a big tin mug. He charged us only 10 cents per mug. Such tin mugs were valued household items. They were often used until the rims and corners got chipped and rusty. When I grew up and joined the army, one of the first things they issued us recruits was a metal food tray and a gigantic mug. I remember telling myself, "Why on earth do we need such a huge mug?" Well, it didn't take long before I discovered that army trainees have a huge capacity for liquid and that the mug actually wasn't excessively big at all. 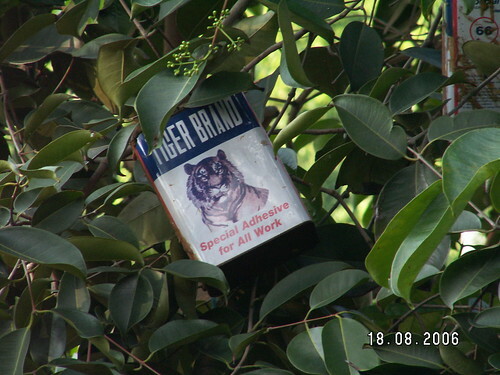 And that reminds me of a funny incident that happened in the OCS (Officer Cadet School) cookhouse. On certain days, they served us 'bandung', a drink made from rose syrup and evaporated milk, which the cook scooped from a gigantic tub. After a hard morning of training, the bandung tasted heavenly. Those of us who went to the cookhouse early and were in front of the queue would gulp down the first cup and refilled our mugs on the spot. Owing to our "kiasu-ness" (selfishness) those who came later found that the huge tub of bandung was fast depleting. So what did the cooks do? Simple. They turned on the tap and topped up the tub with a huge rubber hose! And that reminds me of a tv advertisement of the 70's. 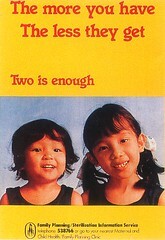 At that time, our government was running a "Stop At Two" campaign to discourage couples from having too many babies. There was this advertisement where a family with many children rushed to the dining table to grab the snacks at meal time. A little girl was too slow; and when she reached the table, her older siblings had already grabbed every thing. The pathetic look on her face was unforgettable. "Two is enough. The more you have, the less they get." was the message. I think the advertising agency which produced that ad is the chief culprit for today's baby shortage problem in Singapore. On a more serious note, I find that many people of my generation have developed a 'survival of the fittest', 'grab as much as you can' mentality. In today's climate of plenty, some of us who have difficulty discarding this 'kiasu' mentality ended up with a weight problem. Please pardon me if you find that I am being too judgmental. It could well be a simple case of deferred gratification because it was not uncommon for kids to go to bed empty-stomach in those early days as you can see from this blog article (Block 13: Humble Beginnings). Consequently, many older Singaporeans have developed a habit of not letting food go to waste. Even in primary school, our children were taught this ancient Chinese poem. Every grain is yielded by such toil. Can any tree expert out there please tell me the name of this strange fruit? 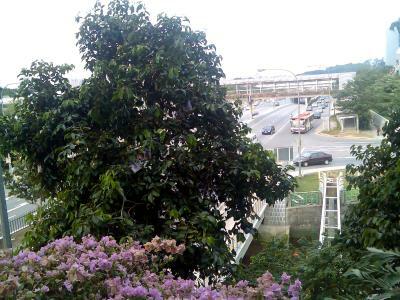 This tree is standing beside an overhead pedestrian bridge along Braddell Road just next to the Kallang River. No More Dead Chickens, but .. Some time ago, I blogged about the stretch of the Kallang River between Bishan Road and Braddell Road. 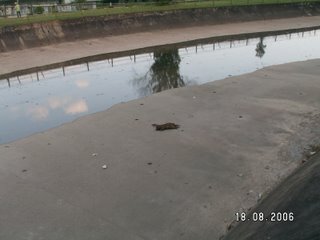 I said that this stretch of the Kallang River once had the unsavory reputation of being called the Dead Chicken River because kampong folks simply discarded their dead animals into the river. 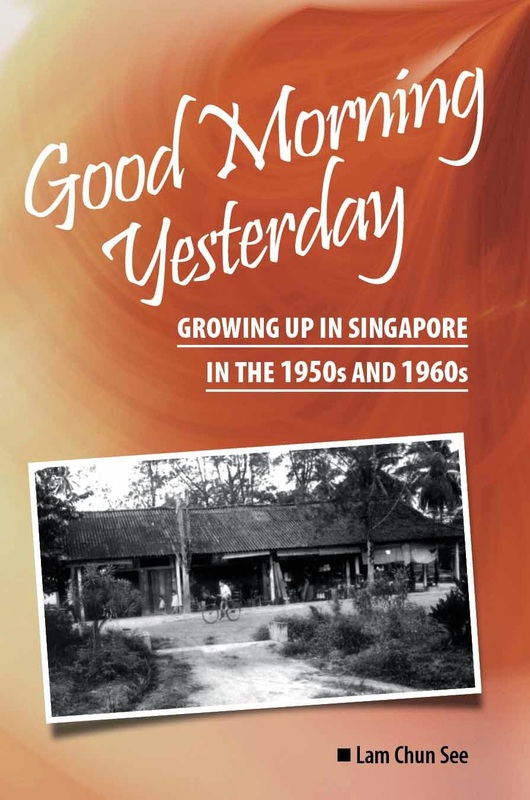 Thankfully, that problem no longer exists today because modern Singaporeans are better educated and more civilized. But I guess I was wrong. A picture is worth a thousand words. I hope the person who discarded this dead cat into the canal did not get the idea from reading my blog. 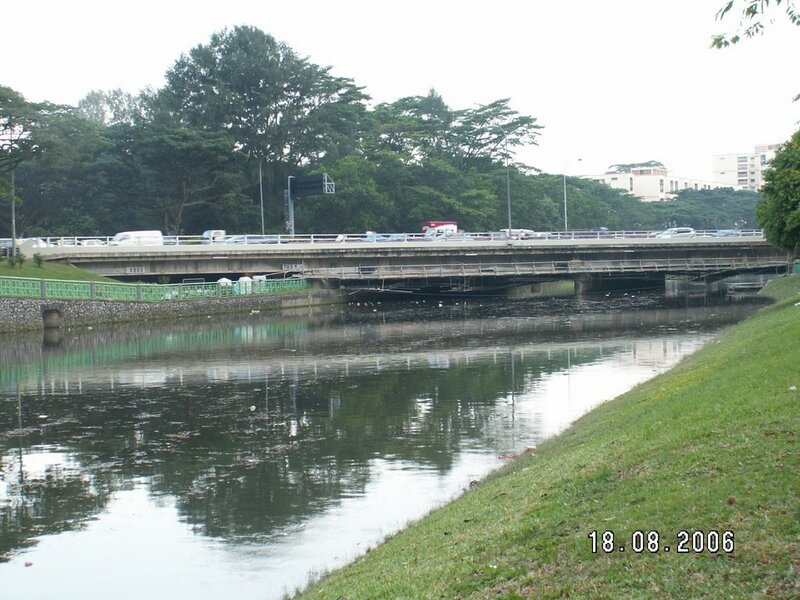 The Kallang River where it meets the CTE. Nowadays, not many Singaporeans rear chickens and pigs, but they certainly use a lot of plastic. My earlier post has inspired Ivan, to share his story about how he came to fall in love with books. I felt ashamed when I read his account because I had neglected to mention my father’s role. So here I am, making amends. My father was probably the biggest influence in encouraging us to read. When my siblings and I were in primary school, he used to borrow books from the library at this place called ‘Lembaga’ – I think it was the Adult Education Department of the Ministry of Education, for us to read. So even in primary school, we read simplified versions of classics such as Lorna Doone and The Black Tulip. 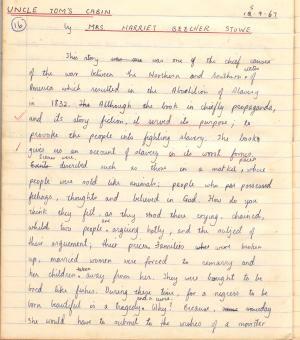 In secondary school, he encouraged us to write book reviews, and he actually took the trouble to mark them. 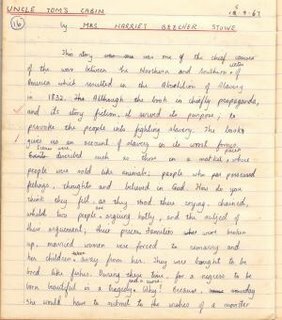 I still have the exercise book on which I wrote those reviews – actually it was just a summary followed by a paragraph of comments. I reproduce a page below for you to see. Please don’t laugh at the childish remarks (if you can read them that is – I deliberately scanned it in low resolution to make it difficult for you to do so. Haha). This was the initial attempt of a Sec 3 kampong boy. 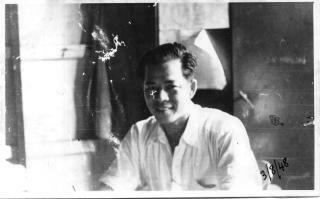 Of course it was also our dad who introduced us to the National Library at Stamford Road and the mee rebus and Indian rojak stalls at Waterloo Street. So you can understand why guys of our generation have such fond memories of that place and felt really upset when the government went ahead to tear it down in spite of much opposition from the public. Like IML, I too try to pass this reading habit on to my children. When they were young, I often read bedtime stories to them. Our favourites were stories from the Children's bible. And they made us repeat the stories over and over again. My youngest, who was the cheekiest of my 3 children, liked to act out a particular scene from The Prodigal Son. Everytime we came to the part where the father rushed out of the house to greet his long lost son and ‘threw his arms’ around him, she would jump off the bed and pretend to rip off her own arms and hurled them at us! I think some of my young readers are preparing for their O levels and some may even be struggling with their English paper. Although it may be a bit late to be giving advice, still I see no harm. The secret to doing well in English or any other language is this: you must try to like it. Try not to adopt an exam-oriented approach like for the other subjects. When I was in secondary 3 or 4, I used to listen to a radio programme called The Chief Examiner Explains. The Chief Examiner was usually an Englishman from Cambridge who gave tips on how to prepare for the Senior Cambridge exams (now called O levels). I remember one particular programme where the speaker explained about the subject, English Literature. The main aim, he explained, was to cultivate in us an interest in books. They tried to select a few good books and hoped that after studying these books, we would develop a life-long love for good books. I must say, that they succeeded to do that for me. The book we studied was No Highway by Nevil Shute. After that, I went on to read almost all of his books. We also studied Terrence Rattigan's play about Alexander The Great. I can still recall this line ... The first conquest is yourself, only after that the world. We also studied narrative poems like Sorab and Rustom, and The Rhyme of the Ancient Mariner. I was fortunate to have a very good English teacher in Sec 4 by the name of Ernest Lau. He often boasted that his class produced the most number of A's for the English paper. I was one of those who frequently scored more than 7 upon 10 for his composition assignments which meant that I had a good chance of getting an A. But as it turned out, I fumbled during the exam and got only a credit. I remember that after our prelim exams, he even made us study poems and Shakespearean plays that were not in the exam syllabus just to reinforce the message that we should study English literature for enjoyment and not just to score in exams. In that regard, I think I got an A after all. Unfortunately, nowadays I don't read as often as I would like to, owing to lack of time. But I still read my King James Bible regularly. Inside this magnificent book, you can find some of the most beautiful verses ever penned in English. As our English bible is translated from the original Hebrew and Greek, I often wondered how beautiful the original verses would have been.